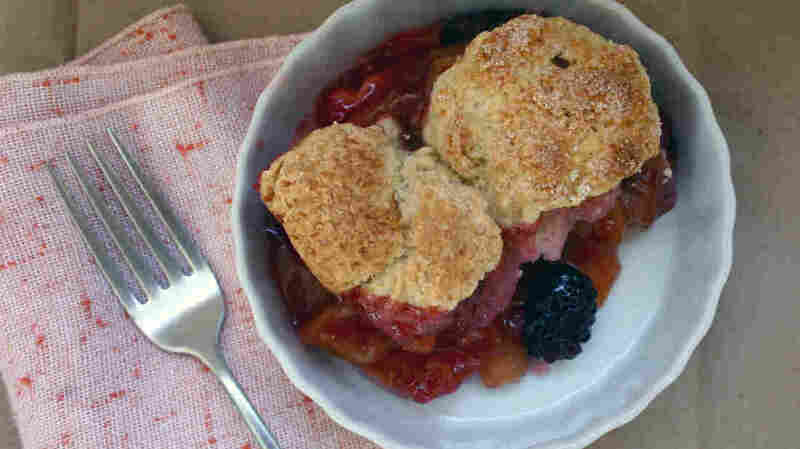 Kitchen Window: Cobbled Together: American Fruit Desserts The versatility of the cobbler family of desserts allows you to experiment with various combinations of summer fruit and swap in biscuit or pie dough, depending on what you have on hand. After all, you're cobbling it together. If the shoe fits, wear it. Get recipes for Peach-Blackberry Cobbler, Plum-Cherry Crumble, Apple-Raspberry Pandowdy and Blueberry Buckle. Cobbler. I didn't understand the dessert until I understood the word. A professional "cobbler" is often thought of as a shoemaker and repairman, but a true cobbler is only a mender of shoes. A cordwainer is the more masterful footwear maker. A cordwainer would not want to be called a cobbler. And a delicately latticed pie would not want to be mistaken for the less artful dessert that's thrown or "cobbled" together with disparate bits of fruit and pastry, whether it's called a cobbler, crisp, crumble, pandowdy or buckle. 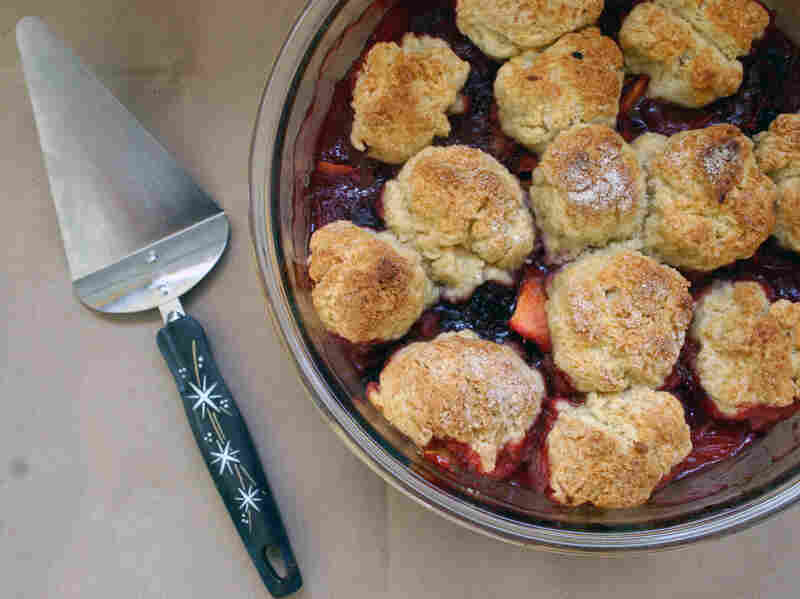 Though a cobbler or crisp may not be as pretty as a fresh pie or a new shoe, the result is just as functional, enjoyable and more economical, at least in terms of time and effort. Cobblers appear in American cookbooks at least as far back as the mid-1800s, where they are described as a dessert or "luncheon" consisting of a biscuit or pastry dough and fresh fruit, often peaches. Though some boast a double crust, what characterizes the cobbler is the baked top crust that covers the sweet, bubbling fruit filling. 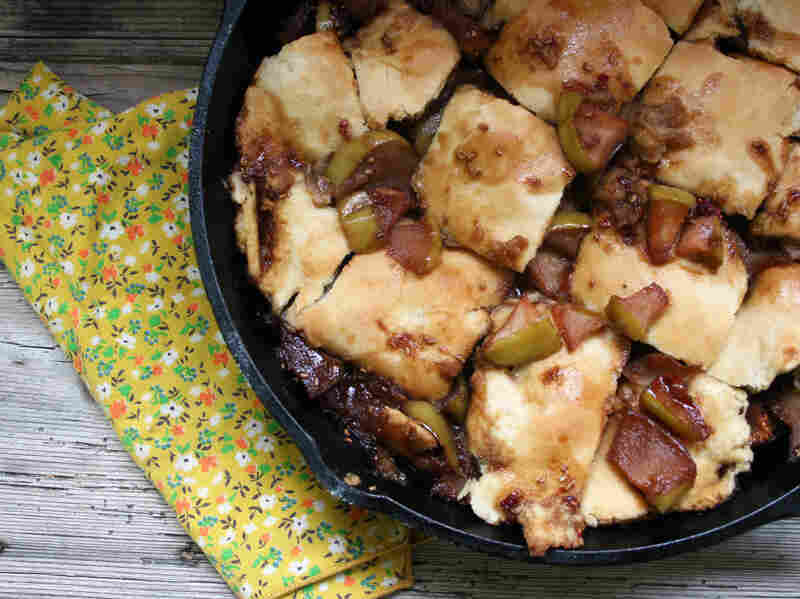 The pandowdy is a cobbler-like dessert with an unusual name of unknown origins. Some consider "dowd-y" to be a variation of the word "dough," and others conjecture that it descended from the term "pandoulde," a regional British word for custard. What we do know is that the pandowdy has New England roots and can be made with either a typical pie dough or biscuit crust. Though a close relation to the cobbler, it varies in two distinct ways: Molasses is used to sweeten the fruit, and just before it's finished baking, the crust is sliced or crumbled into pieces and mixed with the fruit juices to create dumpling-like morsels scattered among the thick filling. For those of you who are paralyzed by making the perfect-looking crust, the pandowdy is for you. You'll spoon the filling over it anyway, so who cares what it looks like? The crisp (or crumble, as it's called in England), is the cobbler's thrifty cousin, sporting a simple crumbled top of sugar, flour, butter and sometimes oats or nuts. All of that is simply scattered over a fruit filling — a great choice for the crust-fearing baker. Most different from its cousins, though still related, is the buckle. No, that's not another shoe reference. It's thought to be so named because the cake-like batter "buckles" under the weight of all the fruit and buttered crumble top. It does indeed, fall a bit in the middle — but that's the berries' fault, not the baker's and the excess of fruit is what makes it special. All these baked creations whip up easily. 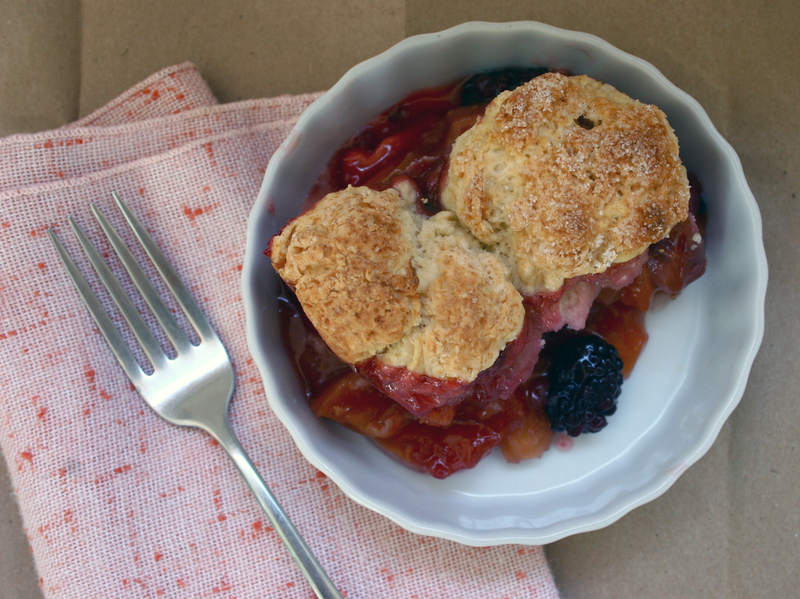 The versatility of the cobbler family of desserts allows you to experiment with various combinations of summer fruit and swap in biscuit or pie dough, depending on what you have on hand. After all, you're cobbling it together. If the shoe fits, wear it. Cobblers are a wonderful way to experiment with combinations of summer fruits. I like to pair stone fruit and berries, as the tart berries provide the perfect counterbalance to the sweet tree fruit. You could easily substitute other seasonal fruits — nectarines, apricots or plums for the peaches and blueberries or raspberries for the blackberries. For biscuit top, in a medium bowl, whisk together flour, 1 tablespoon sugar, baking powder and salt. With a knife and fork or pastry cutter, cut in the butter until mixture resembles the consistency of cornmeal and peas. Add milk and stir gently to combine. Form dough into a ball and cover with plastic wrap. Store in the refrigerator for at least 20 minutes while you prepare the filling. In a medium bowl, combine the peaches, berries, sugars, cornstarch, salt, lemon juice and ginger. Pour filling into a deep-dish, 9-inch (2 quart) glass oven-safe bowl, or an 11-by-7-inch baking pan. Remove biscuit dough from the refrigerator and unwrap. Divide dough into 10 to 12 balls of equal size (an ice cream scoop works well for this) and spoon evenly over the filling. Sprinkle biscuit top with remaining tablespoon of sugar. Bake for 55-65 minutes until biscuit top is golden brown and filling is bubbling. Remove from oven and let cool on a wire rack. Serve warm with a scoop of ice cream. When tart cherries are in their fleeting season, I want to put them in everything I bake. Here with plums, they make a dark, rich and smooth filling, that's made sweet and crunchy by the buttery almond crumble top. In a medium bowl, combine cherries, plums, orange zest, brown sugar and cornstarch. Pour the filling into a 9-by-9-inch baking pan. In a small bowl, combine sliced almonds, flour, sugars, cinnamon, nutmeg and salt. Stir in the butter and use your hands to form small clumps with the dry ingredients. Scatter crumble topping over the top of the filling. Bake 40-50 minutes, until the topping is golden brown and the filling is bubbling. Let cool and serve still warm. Traditionally, pandowdy was made with apples, but here I throw in raspberries to add some tartness and take advantage of the summer harvest. Try using fresh summer or early fall apples such as Gravenstein, Northern Spy or Benhams (if you can find them) — a variety popular in Kentucky and Virginia that bears in August. I like to bake mine in a cast iron skillet, but if you don't have one, a pandowdy can be made just as well in an 8- or 9-inch round or square baking pan. For the biscuit top, in a medium bowl, whisk together flour, 1 tablespoon sugar, baking powder and salt. With a knife and fork or pastry cutter, cut in the butter until mixture resembles the consistency of cornmeal and peas. Add milk and stir gently to combine. Form dough into a ball and cover in plastic wrap. Store in the refrigerator for at least 20 minutes while you prepare the filling. 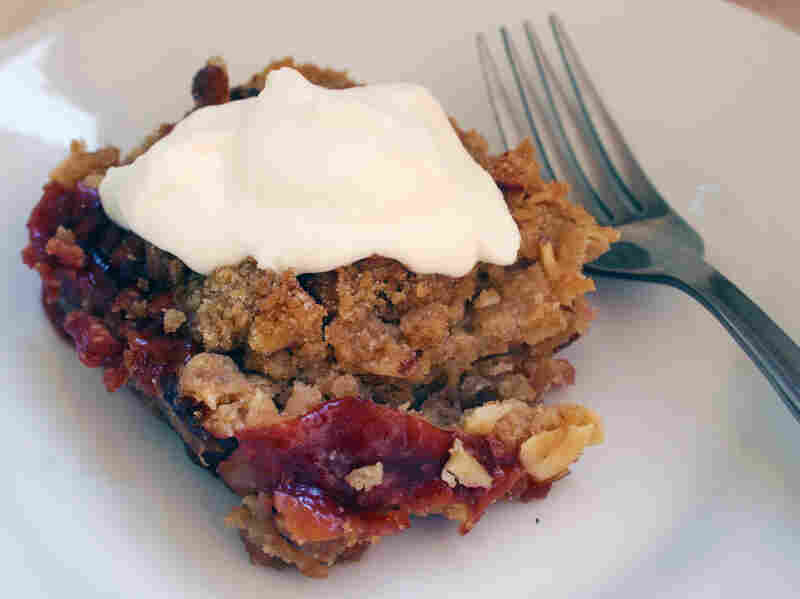 In a medium bowl, combine apples, raspberries, flour, molasses, sugar and lemon juice. Stir in cinnamon, nutmeg, vanilla and salt. Pour filling into a 9-inch cast iron skillet. Cover with foil and bake for 25 minutes. While filling is baking, on a clean, floured surface roll out biscuit dough into a 9-10-inch circle. Set aside. Once filling has baked, remove from oven and cover the filling with the biscuit dough, tucking any overhang into the sides of the skillet and sprinkling with remaining tablespoon of sugar. Return to the oven and bake for 20-25 minutes more, until biscuit dough is light golden and filling is bubbling. Remove from the oven and with a sharp knife, cut the biscuit top into squares. Spoon some of the steaming filling over the biscuit and return to the oven to bake 5-10 minutes more. Remove from oven and let cool. Serve slightly warm. This classic buckle recipe, adapted from Dawn Yanahihara's recipe in Cook's Illustrated (July and August, 2005), uses a thick cake batter to support the overflowing amount of berries that a buckle calls for. A streusel tops it off, making a coffee cake-like treat that's equally good for breakfast or dessert. Blueberries are standard buckle ingredients, and you can use either high-bush or low-bush varieties. For the streusel topping, in a medium bowl, whisk together flour, sugars, cinnamon, nutmeg and salt until well combined. With a wooden spoon, stir in chunks of butter, then work butter into the dry ingredients with your hands until the mixture resembles wet sand. Set aside on the counter while you prepare the rest of the buckle. Grease a 9-inch cake pan, line the bottom with parchment paper then grease and flour the paper and sides of the pan. In a standing mixer fitted with the paddle attachment, cream butter, sugar, salt and lemon zest until combined and fluffy. Beat in vanilla and add eggs one at a time, beating until incorporated. Gradually add the flour mixture while the mixer is on low speed. Mix well to combine, but do not over mix. Batter will be thick. 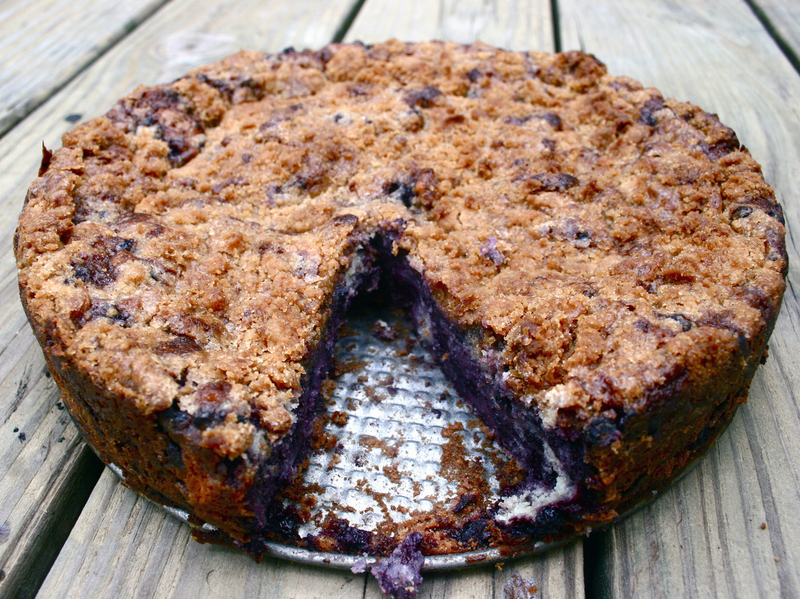 With a rubber spatula, gently fold in the blueberries until incorporated. Pour filling into the greased and floured cake pan, spreading evenly. Scatter streusel top over the buckle batter. Bake about 50-60 minutes, until toothpick inserted in the center comes out clean. Let cool on a wire rack and serve slightly warm or at room temperature.